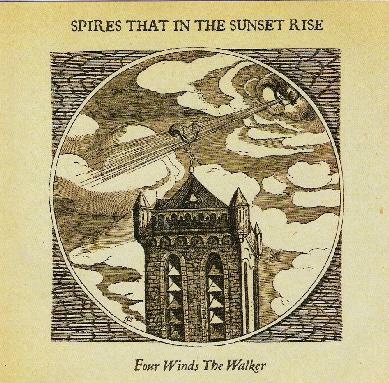 Spires That In The Sunset Rise - "Four Winds The Walker"
Get behind thee Satan! And The Malleus Mallificarum will be my trusty WITCHES HAMMER. The music is horrific in a nice way. It is beautiful in a manic way, and it is strange in a drugged way. It would not be out of place in a horror film, and nor would it be absent in the court of the king, or court of the damned alike. It is folk to an extent, but it is a strange folk. I can hear very mellow, haunting, enchanting vocals, and a cinematic feel to the whole CD that is very emotional. The production quality is very high and the music is energetic, with some nice ideas and songs. As the CD progresses I find that it grows on you. The rhythms are driving in a mellow way and the array of instruments used is, for a folky like me, a nice change to the other stuff that I review. Likenesses? Maybe The Mediaeval Baebes. But I find that Spires That In The Sunset Rise are more expressive than the Mediavel Baebes, and indeed a lot weirder/less commercial. I can also relate them to The Incredible String Band, Corvus Corax, but think that the Incredible String Band/Medieval Baebes are the closest resemblance. But as I say, these girls are more earthy and raw in the sound department than the Medieval Baebes. So for that reason they are in a different world. I could also say that the haunting nature of the CD is fixed on a nice groove, and I would really advise you to get a hold of a copy, because it is probably the best CD that I've reviewed this issue. And that can't be bad if I like it without quibble or slating! This is because the hypnotic beats and rhythms are driven. They are earthy, and as one reviewer put it, "Sounding like a brood of witches from Macbeth" (see AI #31). And he wasn't wrong. That's your very realistic similarity. Would love to hear more because some of these tracks are quality songs. Very enchanting.